Listen in and Become a Part of AE911Truth’s Mission! Today is the fourth day of our annual membership drive. A few weeks out of the year, we pause to recap where we’ve been and outline where we’re going next. And we ask you to invest in our work so that we have the means to advance the pursuit of truth and justice on your behalf. Please take five minutes this weekend to become a sustaining member. Whether it’s $5 or $10 per month or more, your contribution is what enables us to keep going and to become even more effective at moving the needle in favor of 9/11 Truth. You’ll also have the satisfaction of doing something important for this vital, historic cause. To learn more about where your generous contribution will go, we invite you to tune in to last week’s episode of 9/11 Free Fall. 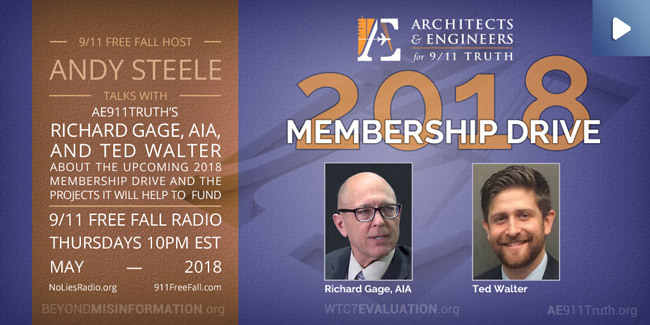 AE911Truth founder Richard Gage and director of strategy Ted Walter join host Andy Steele to highlight our most important projects for the year ahead — projects we need your help to carry out! — and to reflect on the early days of this one-of-a-kind organization. If you’re already a sustaining member, please make sure your membership donations are still processing (credit cards expire, which presents a real problem for us). Contact us at membership@AE911Truth.org and we’d be happy to check for you.